Thanks everyone! There's some great info here. For those of you who usually bring tripods, how do you pack them or attach them to your pack? The couple of times I've tried to take one, it's been buried in my pack or lashed to my pack in a way that makes it hard to access. Either way resulted in me very rarely using it because it was too much trouble to unpack. 1) attachment to outside of my pack basically by a home-made connector made of a small length of rope and little non-load bearing carabiner. You tie the rope securely to the tripod near the top (by the head or to the head itself). The carabiner clips onto something near the top of the pack (pick a strap, any strap). 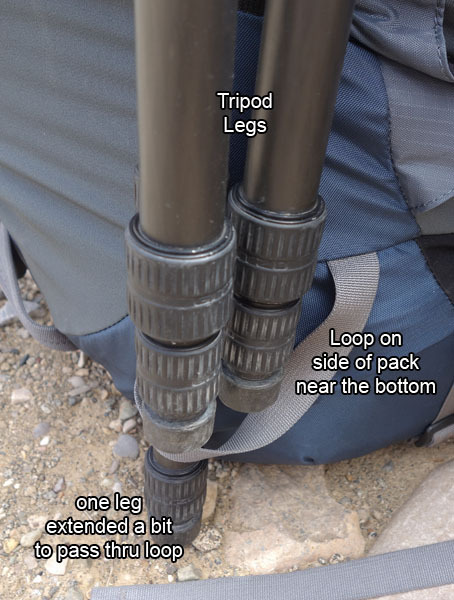 Then, you let the tripod hang vertically and slip one or more legs into one of the many straps that's sure to exist near the bottom of your pack. This works, but if it's not secure enough, the tripod may slip around a bit. 2) slide the folded tripod through the straps at the very top of your pack (the tripod sits horizontally like a rolled up mat). This also works, but the tripod always has a habit of slipping out sideways and falling to the ground. If you do this, you may want to find some method of securely clipping it to your pack. Or, you can always just hand-carry the thing. I often do this when I'm in a mode of stopping often to take photos. Thanks guys for the great explanations! Bookmarking this one for later.. I use rocks. Sometimes I'll use a couple of sticks. I've also been hauling this guy around for around ten years and it keeps on keeping on. I have no idea where i picked it up, though. Regarding the carry question, I simply put one of my legs in between my belt for my pack and my hip. This way I can grab it quickly and without taking my pack off. Incidentally, I had a guy send me a hiking stick/ tripod combo to try out in exchange for a review. He didn't like my review and I think I gave it to someone. Way too flimsy for my needs. 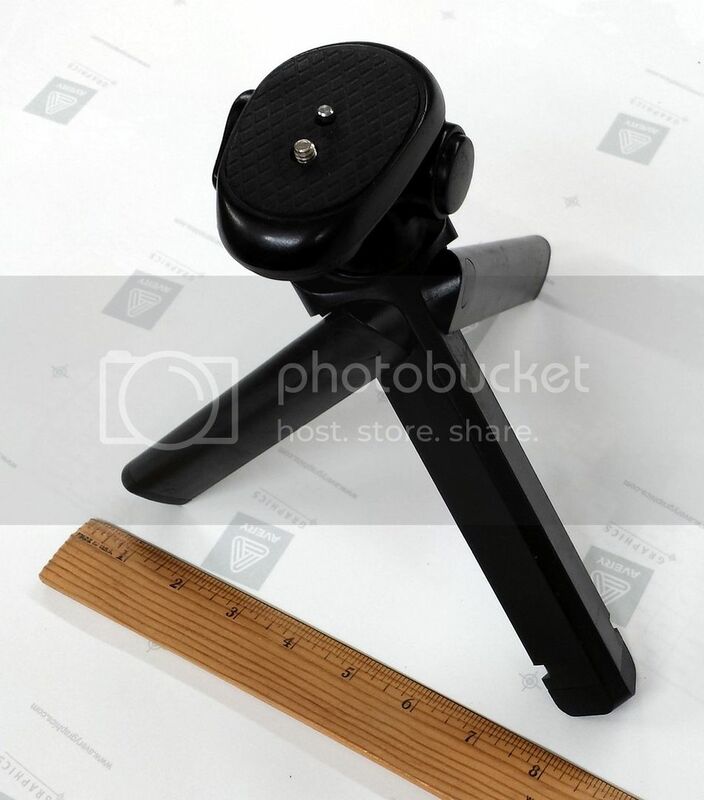 Besides my 'regular' tripod, I have been using something similar to what Buck has suggested, if weight/size is of the essence. It holds a camera up to 6.6 lbs. I have used this pocket tripod with a zoom lens attached to my Olympus PEN LITE (E-PL3) with no problems whatsoever, even in windy conditions. Tiny measurements, easy and fast setup. Mainly designed for macro shots, it also works for landscape photography/selfies etc. if you can place it on a rock or something similar. Great quality, have used it extensively for almost 3 years now. If you've ever read the books by Galen Rowell, his approach was to go light as possible and make do with what was available to him. When he couldn't tolerate carrying a tripod, he'd use rocks, fence posts, or brace his body up against something sturdy like a tree or large rock. He did a lot of shooting while rock climbing, so nearly all of that work was hand held. You can grab a stick or old Sotol stalk and use it as a makeshift monopod. It helps to cancel the up-and-down movement as you hand-hold the camera. You can even grab 2 or 3 sticks and make a quick bipod or tripod. Just hold the sticks bunched-up in your left hand, and then hold the camera on top with your right hand. Use the viewfinder (optical or electronic) if your camera has one (so that the camera is pressed against your face). If you use the LCD screen to compose, then try to get the camera as close to you as possible. Holding it out at arms length makes it difficult to hold steady. Draw your elbows in and spread your feet out just a bit. Exhale and hold briefly while you gently squeeze the shutter. It's very much like target shooting or hunting with a gun. Take several shots to better your chances of getting a sharp photo. If your camera has a burst mode, then take 3 - 4. Often the first and last images will be slightly blurred due to you pressing and then releasing the shutter button. The right technique can greatly improve your camera steadiness. Back when I was more focused on photography I remember reading that a tripod should weigh about 7 lbs. or so, something I would never carry on a backpack (though I did pack a backup camera body). I always thought that the ideal tripod would be a hollowed-out model capable of holding a gallon of water, preferable with a spigot attachment. Do monopods work? I tried using one once, but didn't notice much improvement. Of course, I'm sure I wasn't using it correctly. Is it possible to get a sharp picture off a one second exposure with one? 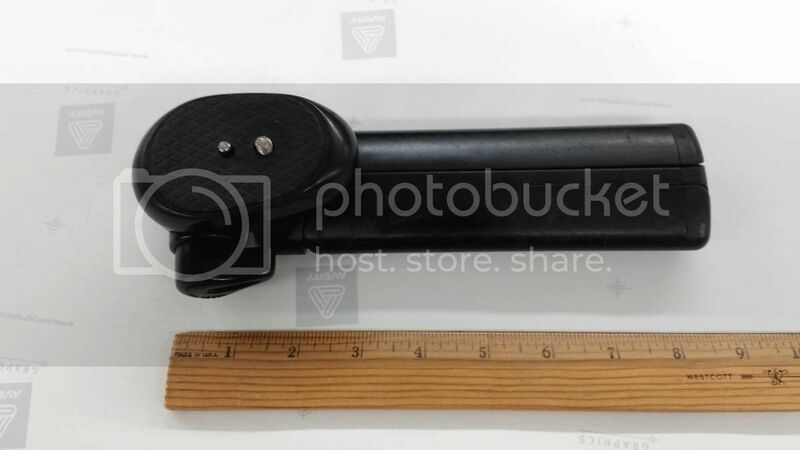 Ok, so it is not a tripod. But this guy has been with me on trips for over 20 years and is responsible for countless group shots and low light landscapes. Granted, it is not as flexible as a tripod and I have to improvise to get any elevation by using a post, rock, etc. Anyway, I always have this guy with me and it has come in handy on countless occasions when I would not have even thought to bring a tripod. 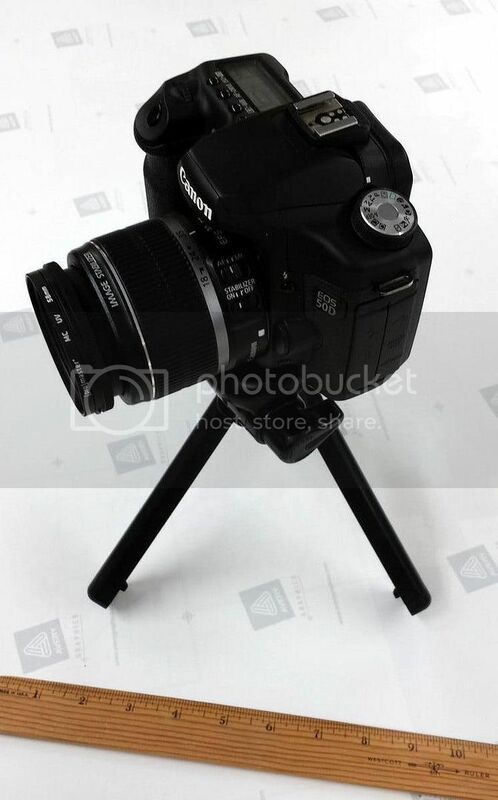 Ok, so it is not a tripod. Granted, it is not as flexible as a tripod and I have to improvise to get any elevation by using a post, rock, etc. On the plus side it cost less than a buck to make, it fits easily in a pocket, it works with any size or style of camera, it is unbreakable, there is no reason not to have it with you. I can only 2nd dillomaster's comments. Usually I take a pocket tripod and a bean bag on any hike. But if I had to choose just one item, it would be the bean bag. I've used rocks before... and all kinds of other things... whatever it takes. 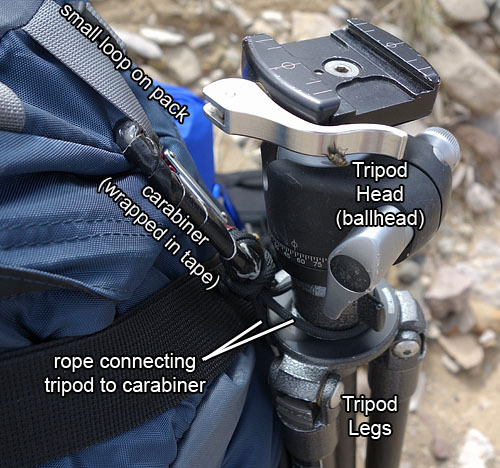 Tripod / ball head: Depends... What kind of gear are you carrying? How serious are you? for me, I'm 100% in TJ's camp. I've got a pair of Gitzo carbon fiber tripods. I don't use center posts. Not counting my Wimberly my ball heads are RRS heads with the quick release lever. BH 50, 40, and 20 (I think). I also have an old Arca Swiss that has been around since the 80's. It's never let me down. I put an RRS quick release plate on it a few years ago. Some of the heads are on time lapse rails but it's easy to move them. I have one on a little RRS ground pod. The ground pod is heavy but it's small and with a little BH-20 ball head it's lighter than either Gitzo (but not by much). I've hauled it up to the South Rim a few times. but I have yet to use it. I think it's going to be just what I need and hopefully not a closet queen. It has a pouch for tripod legs, hydration bladder, and room for stuff. Monopods do help but you'll never pull off a sharp one second exposure. They minimize vertical shake but do less for horizontal. Combine a monopod with bracing yourself against something vertical and they'll do even better. Somewhere on the internet there are probably some suggestions on monopod technique. I use a monopod for some things like shooting my kids' performances when I need to recompose quickly but they are not a substitute for a tripod. I tied two loops of rope around the top of the tripod legs (just below the ballhead) and also tied on a carabiner. I wrapped the carabiner with Gorilla tape so that it would minimize the scraping against the ballhead as I hiked. The carabiner attached to a small loop that's part of my pack near the very top but slightly on the side. The weight of the tripod hung from this attachment. 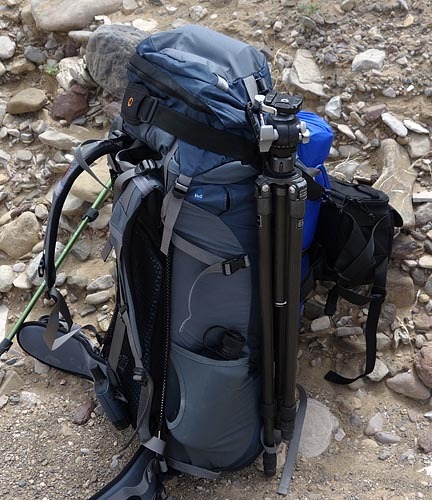 I extended one leg of the tripod a few inches and passed it through a loop near the bottom, and on the side of, my pack. This kept the tripod from flopping around as I hiked. This worked pretty well. The tripod stayed put and I had no issues with it bouncing around where it would be annoying. Access was easy - to remove the tripod, just pull up and unclip (provided my pack was off).